Graduate researchers from Associate Professor Reza Ghodssi's (ECE/ISR) Micro-Electro-Mechanical Systems (MEMS) Sensors and Actuators Lab shared first prize at the third annual IEEE Lasers & Electro-Optics Society (LEOS) Baltimore and Washington-Northern Virginia Graduate Student Poster Competition. Co-authors Nathan Siwak, Xiao Fan, Dan Hines, Ellen Williams, Professor Neil Goldsman, and Ghodssi won the award for their research, titled "Chemical Sensor Utilizing Indium Phosphide Cantilevers and Pentacene as an Absorbing Layer." The award was presented on April 25, 2007 at the Johns Hopkins Applied Physics Laboratory in Laurel, Maryland. The research is a continuation of the group's ongoing Indium Phosphide MEMS research program to develop single chip sensors. These sensors can be used to detect harmful substances, including toxic gases or even explosive vapors. Single chip sensors using this technology can be used in future handheld personal protection sensors for the military, and will help to miniaturize chemical sensors for airport security-type applications. 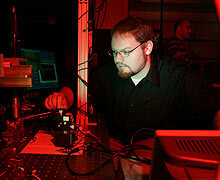 More information can be found at the MEMS Sensors and Actuators Lab website.